Gaming is growing. It’s been several years since game sales overtook movie box office sales, and the industry continues to grow. In addition, the landscape of gaming platforms is changing. In the past, games were primarily played on dedicated gaming consoles and PCs, but today it is mobile platforms that take the biggest share of the revenue. Next up are fully immersive virtual and augmented reality systems. Another trend are new sensors: gaming platforms are more often adopting 2D or 3D image sensors, like Microsoft’s Kinect. In the last few years, augmented and virtual reality have gone from science fiction and research to shipping products. Augmented reality applications augment our surroundings with a virtual, computer-generated world. These two worlds need to be correctly and realistically aligned with each other, which can only be done using 2D and 3D cameras and a healthy amount of image processing. Gesture-based user interfaces allow for more natural, intuitive and easier user interfaces than what keyboards or touch screens can provide, especially for gaming. Low-latency and accurate operation are key for these applications. Without it, the gamer quickly loses interest. Speedy interfaces require a high-performance imaging subsystem that perform many calculations in milliseconds. 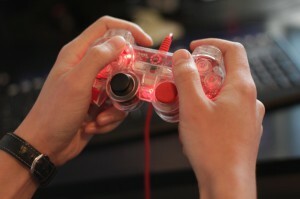 Depth sensors bring a totally new experience to gaming. Whether they’re used for augmented reality, gesture control, or body sensing, 3D sensors provide a wealth of extra data compared to standard 2D cameras.